Every time I pick up and begin reading a book by Patricia Moyes – one of her splendid Chief Inspector Henry Tibbett books – I am reminded of two things: how much I like them and that I always wonder why I don’t just sit down and read the lot of them, straight through. Instead I seem to go months, or years, between them. But another book catches my eye, and another, and you know how that goes. I implore you, read at least one of these. I’m not managing to read the books in order. Of course I could look up the series order, but I never seem to do it, instead just pulling one off the shelf. No matter. they’re all good. 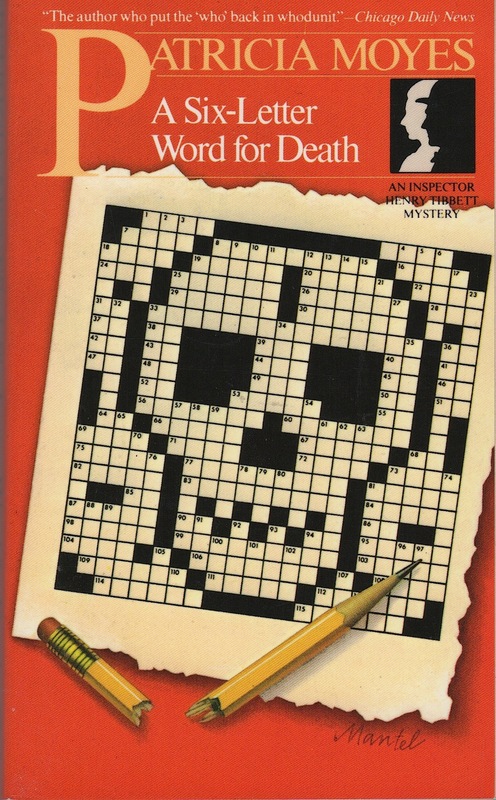 For anyone keeping track, A Six-Letter Word for Death is listed as #16 (of 19). Though many Moyes books and short stories are “typical” Scotland Yard CID cases, equally as many seem not to be. This tale isn’t actually a case at all, and Tibbett is not the officer in charge of any formal investigation. He gets some cooperation from local police – and some non-cooperation as well – but primarily he investigates this one because he sees something wrong and his curiosity and desire for justice won’t allow him to let it go. The Guess Who Club is composed of several authors, mystery writers all, who share as their publisher Oppenshaw & Trilby, chaired by Sir Robert Oppenshaw. Each member of the club is an author who writes under a vigorously protected pen name. Each summer these writers are the guests of Sir Robert at his Carnworth Manor on the Isle of Wight. They meet for a week, and on the last Saturday of this time they have a guest speaker, someone to speak for an hour or two on a topic of mutual interest and also to justify writing off the entire week for tax purposes. This summer the guest speaker is Henry Tibbett. The club decides to twist Tibbett’s tail a bit by creating a crossword puzzle for him to solve, the answers of which will supposedly point to a crime or crimes which he may then solve. This isn’t usual procedure, but it is suggested by one member of the group and the others agree. All in fun, don’t you know. Thus we are drawn into a web of personality, history and deceit. Moyes pulls things together with the help of a gentle coincidence or two, but they are adequately justified. The story goes on, the mystery is solved, justice served. I’m not sure what I like best about Moyes books; the writing, the people, the puzzle or the sense of place, but I enjoy them quite a lot. If you haven’t read any of Moyes books, you’re in for a treat. This entry was posted in Friday Forgotten Book, mystery and tagged Moyes, Tibbett. Bookmark the permalink. I’ve read a couple Patricia Moyes mysteries and enjoyed them. I haven’t seen A SIX-LETTER WORD FOR DEATH before but I’ll be looking for it. I know why I don’t read them now – I no longer read that type of British mystery very often – but I could not tell you why I never read one back in the day I was reading authors like Moyes all the time. For instance, I read all of Dorothy Simpson’s books about Luke Thanet but not these. Why? Don’t know. I did read her Crippen & Landru collection of stories – certainly one of the first (if not necessarily the first) titles they published – and I remember enjoying it quite a bit. I read some of these when I was a lad and as I said on Bev Hankin’s blog I’ll be damned if I can remember anything about Tibbet or the plots. I’m sure I must’ve read this one because the combination of a crossword puzzle (still an addict) and murder mystery was a big draw to me back in the 1970s. I asked her to send me a couple Moyes books as part of my prize for being a Bingo winner in her reading challenge last year. So I’ll be returning to Moyes some time this year. WHO KILLED FATHER CHRISTMAS? and Other Unseasonable Demises was the title of the short story collection. George, I enjoy Moyes books, they’re a nice combination of mystery and character. Jeff, I would have thought you’d plowed through these years back. Somethng to look forward to. Yes, I have that C&L collection. John, it’s the Tibbett character that I like, the mysteries are typical, but well done, for the times. This is an older review I wrote for my mystery fanzine that I just updated for Bullhorn. I need to read another one of these soon. Charles, there are plenty of them out there, if you feel like dipping in. Thanks, George. I guess I could have put that on the end of the post, but it seemed long enough already. The Tibbett books are all good, in my opinion.